It’s that time of year again. Schools across the country are preparing for the inevitable end of summer, and the start to the new academic year. It can be a busy time for schools, and we want to help. To do so, this issue of Ridealong with Synovia Solutions will take a deep dive into the different ways schools can be sure they are ready to go come August. In this edition, we start by exploring the feedback we’ve received about our student tracking app, Here Comes the Bus®, from parents and schools alike. We’ll also look at the latest trends in the transportation department and explain the benefits of having tools such as Wi-Fi and cameras on your school buses. In the next section, we’ll take a deep dive into topics like student ridership, hiring the best bus drivers, and GPS navigation. We’ll also talk transportation trade shows and provide a case study from one Indiana school that has experienced a very successful transformation of their transportation department. We’ll wrap up this edition by focusing on preparation for the new school year and how solutions like Here Comes the Bus can make your life as a transportation director a little easier. We’ll dive into the benefits of offering a student tracking app to your parents and students and explain the keys to success, such as effective communication with the district. 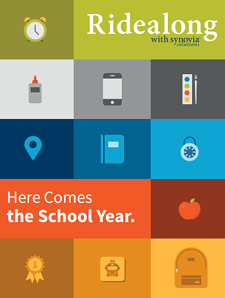 So, as you buckle down and plan for the new school year, we hope you enjoy this edition of Ridealong with Synovia Solutions. We’re excited to share the most up-to-date fleet management information with you as you get ready to kick off another great year! What Can GPS Do For You? Are you sure you know all the benefits? It’s imperative that you understand what GPS tracking can do for you. What are all of the benefits experienced by businesses and school districts with fleet management solutions in place? 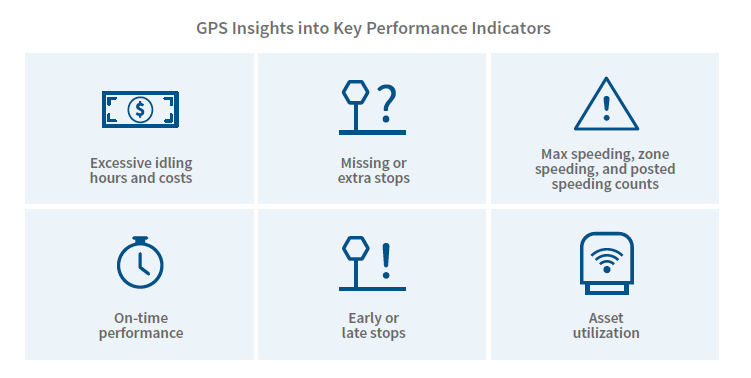 At a high level, there are some key performance indicators GPS can give you immediate insights into. Because, ultimately, the transportation team must get their vehicles where they need to go, safely and on time. With a GPS solution in place, your tracking options are endless. Whether you need visibility into your entire fleet of buses or just a few, tracking and reporting is seamless. The data is provided in real time via an easy-to-use software platform. You have instant visibility into your fleet. This data can then be used when issues arise. Now, if a parent calls to complain or question whether a bus made the right stop, you’ll have the data to back you up. Another perk to GPS tracking is easily customizable boundaries. Define the areas you want to monitor and set up a custom geo-fence. You will then know precisely when vehicles enter or exit these areas, giving you insights into things like on-time departure and arrivals. Once you have your solution installed, you can set up all kinds of alerts and reports to make your day-to-day job easier. Alerts can come in the form of pop-ups, emails, or text messages, depending on your preference. You can also easily see and overview past alerts, and review new ones to dig into specifics to determine when and why they occurred. Ultimately, a GPS tracking solution will not only lead to better management of your fleet, it will also send the message that your business or school district is serious about providing the best possible transportation service. 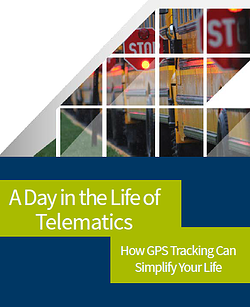 To learn more about GPS tracking, download your free copy of our magazine, Ridealong with Synovia Solutions. We'll help you stay on top of the latest fleet management trends, and decide what's right for your team. By now, most transportation teams understand the benefits of GPS tracking. The worry, though, is that they will have the technology in place, but not the resources to take advantage of it. Luckily, that is not the case. Our newest eBook walks through how to get the software to do all the work for you, and make your life as a fleet manager easier. A fleet management solution allows you to stay connected with your fleet and save time and money in the process. Running a large fleet is never easy, but tools such as GPS can help. Download our eBook to understand exactly how this visibility allows you to better manage your vehicles and drivers. And provides you, the feet manager, with some much needed relief in your day-to-day duties. How GPS-powered tools can improve your payroll system. When you run a transportation department, your responsibilities never end, from safety issues and driver behavior to route planning and fleet maintenance. To complicate matters even more, you also have very real budget concerns and, too often, budget cuts to deal with. Luckily, many people have realized that GPS technology can help them do more with less while saving both time and money. What many don’t realize, though, is that your payroll system is no exception – there are GPS-powered tools available that can help you better manage it as well. A time and attendance solution allows your drivers to clock in and out within their vehicles. 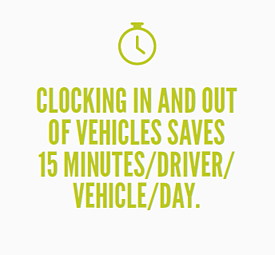 This eliminates paying for non-driving time, and on average it saves 15 minutes per driver, per vehicle, per day. You can ensure your drivers are being paid accurately for their time on the road. When looking at solutions, you need one that can integrate with your current setup. All the information captured through GPS tracking needs to be exported to the payroll system you’re already using, quickly and easily. This eliminates any extra work during implementation. Logging time by hand introduces the possibility of human error, causing your payroll accuracy to suffer. By automating time collection, you save quite a bit by eliminating inaccurate time entries. Even if you’re off by as little as one or two percent, that can have a significant effect on your overall payroll budget, no matter whether you manage 50 vehicles or 5,000. One of the largest benefits associated with logging driver time electronically is being able to accurately capture time for payroll purposes. Since you are paying your drivers based on time, it’s critical to know how much of that time is actually involved in a specific route or activity. A time and attendance solution enables your drivers to log a job type with the same keypad they use to clock in from their vehicle. With this type of solution, you can also review and manage the time that is being collected. As your drivers log in, your GPS system is sending that data back to you. You can review to see who’s logged in, what their time cards look like, and more – all in real time. 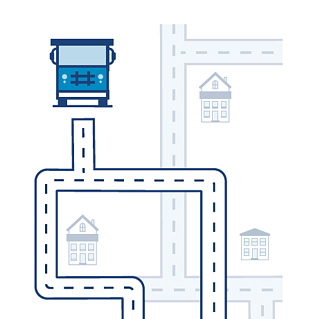 In addition, you can compare your existing route schedules from your planning system to the actual time being logged by your drivers. If a driver assigned to a six-hour shift is logging eight hours, you’ll know. The GPS solution should also include an employee portal, which allows drivers to log in and view how many hours they’ve logged. The employee portal allows non-drivers or dual-role employees (for example, someone who may drive in the mornings and work as an office employee during the day) to log time spent on activities that don’t involve operating a vehicle. This can be done from a computer, so time spent both on the road and in the office can all be captured on one time card. Even if one of your drivers forgets to log in or out, GPS data will provide you with a full picture of that driver’s day, from when that driver left to the time they returned. There are no “he said, she said” arguments over time discrepancies because all the data is right there in front of you. Let’s walk through an example of potential benefits and cost savings. Below are some of the major differences experienced by one of our clients with Synovia’s Time and Attendance solution. Prior to implementation, their process looked something like this. Drivers would fill out timesheets and clock in at their schools. The schools would then review the time by hand, increasing the manpower needed to complete payroll. There was a lack of accountability and accuracy overall. After implementation, drivers clocked in directly from the bus. The transportation department was able to quickly audit time using the data provided by the software. They also utilized a daily payroll import to ensure payroll accuracy. So, what was their overall result? 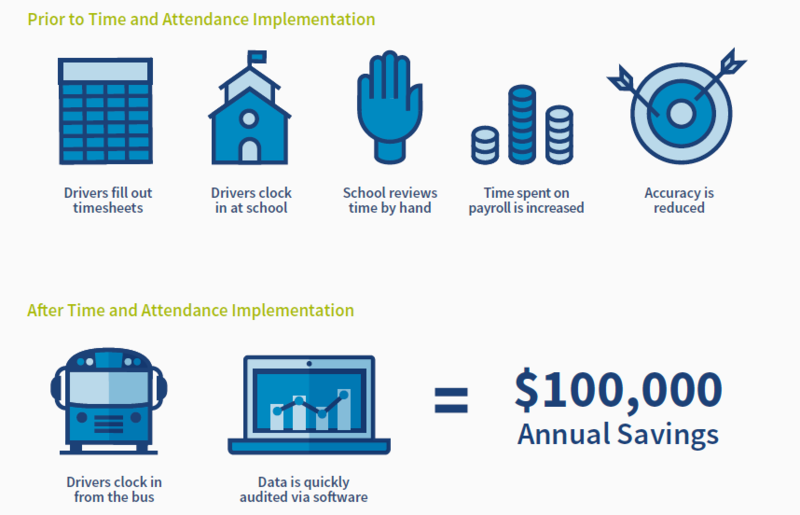 The school has reported $100,000 in annual savings since moving to Synovia’s Time and Attendance solution. Many schools have decided to say goodbye to timesheets and manual entry. They are instead turning to GPS solutions for accurate time tracking, easy-to-read reports, and payroll integration. The benefits are endless, from more effectively managed fleets to large cost savings. If you want to learn more about Synovia's TIme & Attendance solution, sign up for a free demonstration. Loxahatchee River District manages both a fleet of vehicles, and some very expensive heavy-duty equipment. It’s their job to provide a valuable service to the community each and every day, as efficiently as possible. To do this, they recently turned to GPS and asset tracking to be more forward looking in their business. They were experiencing some issues typical to managing a fleet of their size, such as lack of clarity into what their drivers were doing daily. And they understood the risks of using and managing such expensive equipment. 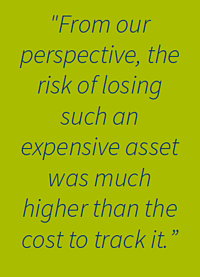 They realized the risk of losing such pricey assets was much higher than the cost to track it. A complete GPS tracking solution can provide many benefits to organizations like Loxahatchee River District. Tracking vehicles, mapping routes, and insightful reporting are just a few. Read more to understand the complete story of Loxahatchee’s success. Selecting the right fleet management solution is no easy task. You must make sure it meets your needs, and you need a complete understanding of how it will help you in the long run. Will it help keep your riders safe? Will it help your drivers increase their route efficiency? Will it save you money and provide a noticeable ROI? These questions and more must be considered when evaluating potential GPS tracking solutions. As technology improves, more and more solutions come to market. How do you know which is best for you? Below are several factors to consider when selecting your tracking solution. What Is a “Nice to Have” vs. a “Must Have”? There are many different solutions available now; it’s not just standard GPS tracking. Determine what is important for your school district or company first, and find solutions that match your needs. For example, how does your transportation team currently track time and attendance? Would they benefit from an all-in-one solution that allows drivers to clock in and out on the bus, rather than relying on hand-written time cards or clocking in at the school? Another aspect for schools to consider is parent communication. Some solutions, such as Synovia’s Here Comes the Bus®, offer unmatched communication with parents and students. Whether it’s knowing how close your bus is or knowing when your child gets on or off the bus, Here Comes the Bus provides an easy answer. By closely examining your needs and wants, you will be better prepared to evaluate the GPS tracking market and all its available options. When evaluating different solutions, it’s very important to understand how the software works. First, think through who will be using the software on a daily basis. What are their needs, and how will they need to incorporate the software into their day-to-day lives? You may also consider asking the vendor if you can try it out before you buy. Let the users inside your organization test the software in real time. Is it user-friendly? Does it give them the information they need to make their jobs easier? Demos and trials are a great way to determine whether the technology is going to work for you and your team. ask is: can you afford not to have a GPS solution in place? their school buses. Both times the petition was denied, and then one day that school system had three different buses collide with each other while out on the road. While thankfully no children were seriously injured, later on it was determined that speeding was a significant factor in the cause of the crash. The crash could have been avoided altogether if the school system had simply been tracking their drivers’ behavior a little more closely. The liability alone of what could have happened if just one of those students was seriously injured is scary, not to mention the real toll of such an incident to parents and students. Fleet tracking software can let you know in real time (as it’s happening) if your drivers are exceeding the set speed limit, and by how much, in order to help prevent things like this from happening. As with any investment, you must take the time to fully explore all options available to your school system. Speak with other school districts to see how they are managing their fleets. Ask vendors for references and case studies. And, ultimately, find the solution that works best for your organization. A GPS tracking system is a large investment for most companies and school districts. You want to make sure you get the biggest bang for your buck. And you want to make sure you’ve got a plan in case something goes wrong. This is where Synovia’s Synsurance comes into play. It’s the unique value provided to Synovia customers to minimize their risk and give them peace of mind that we’ve got their back, no matter what. Lifetime Technology Warranty: For as long as you are a Synovia customer, any defective hardware on your buses will be replaced at no charge. Additionally, customers are provided unlimited access to Synovia’s customer portal for software support. replaced with a spare. Then simply send the defective unit back, and receive a new shelf replacement at no additional charge. First Time Fix, or Synovia Pays: If you log the same issue more than once within thirty days you will be credited one day’s charge for your entire fleet. No questions asked. No Limits: With Synovia’s Synsurance, you receive unlimited user licenses as well as unlimited training webinars and videos. All-inclusive Service Fee and Price Protection: Everything is included in the service fee – use of hardware, installation, software and updates, implementation, hosting, data plan, support, and training. There are no surprises. And the service fee will not increase over the lifetime of an agreement. Guaranteed. Access to a Municipal Lease: Synovia understands that sometimes budgets change and funds are redistributed. With Synsurance, if funds are no longer available you may cancel the agreement without penalty. With guarantees like these, it’s easy to see why Synovia’s customers have minimized their risks and reaped the benefits of their GPS tracking solutions. Find out if your company or school can be one of the many that benefit from fleet tracking and Synovia Synsurance with a free demonstration. You’ve decided you need a GPS tracking solution. The benefits are all too clear, and it’s time to make the change. But how do you ensure that you make the best decision possible, and that the implementation of the solution goes smoothly? There are a couple of simple things you can do to mitigate your risks when implementing a fleet management software solution. First and foremost, you need to make sure you have a solid understanding of what you need and why. What is the driving force behind the decision to use a GPS tracking system? What problems do you need the solution to solve? Only with this understanding will you be able to select the best solution for your school. And since there are many different options out there, be sure to research each of them thoroughly. Ask for a demo or even a free trial before you buy to ensure the solution will work for your specific situation. The better the system (and the company), the more likely they are to be comfortable with offering you some kind of guarantee for their product. Do they offer hardware warranties? Are they willing to reimburse you for downtime? Are you given spare hardware up front, so if there’s any kind of failure you can replace a malfunctioning unit right away? The better the guarantee, the more likely it is you’ll be happy with their services, and the less risk you take on with the implementation of the software. 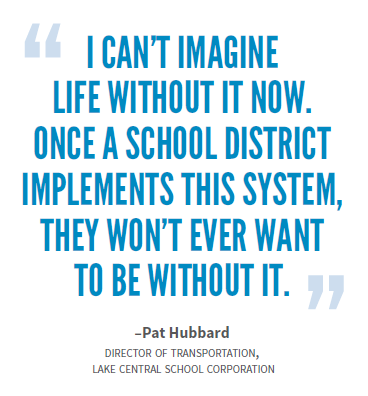 the benefits that the entire district will experience, from better route management to significant time and cost savings. Finally, ensure that you have a training program in place. Select a vendor that provides solid training materials, such as on-demand videos and webinars. With the proper preparation to reduce your risk, a GPS tracking solution project can go off without a hitch, and begin to provide benefits immediately. ARE YOUR DRIVERS RUNNING THE RIGHT ROUTES? Gaining insights you need for better route management. Are your drivers taking the routes you want them to? You have spent countless hours planning to ensure they are given the best and most efficient routes. But without the proper tools in place, you have no way of knowing whether your drivers are following the routes you’ve specified. To combat this problem, consider integrating your routing system with a fleet tracking solution. Why? Because it means you’ll know when each vehicle should be at each stop, and whether they arrived as planned. Essentially, you can compare your planned and actual stops while also receiving informative summaries of the overall activity of your fleet. One of the major advantages to this kind of visibility into your fleet is improved customer satisfaction. It can be frustrating for your customers when there are unexpected delays or changes in the normal routine. Instead, imagine a scenario where you would be able to quickly alert your customers if a planned stop changes, or if the driver has deviated from the expected route. This would make your customers happier, and lead to fewer complaints to your transportation department. Ultimately, combining your route planning and GPS tracking allows you to effectively manage your routes. You can better ensure on-time departures and track route compliance. You can manage time performance and keep key people informed at all times. So the real question becomes: why wouldn’t you implement this solution? Better visibility and understanding is key to planning and running the most efficient routes. School districts and businesses with fleet tracking tools have all the information they need to make the right decisions – and more. To learn more about this, and other Synovia solutions, download your free copy of our magazine, Ridealong with Synovia Solutions. We'll help you stay on top of the latest fleet management trends, and decide what's right for you. Your vehicles are one of your transportation department’s biggest expenses. As the fleet manager, it’s your responsibility to ensure they last as long as possible, which requires staying on top of your vehicles’ maintenance. Since it costs far less to prevent an issue than it does to fix it, Synovia offers fleet managers live diagnostic information about their vehicles. This provides you the visibility you need to eliminate unexpected – and costly – surprises. 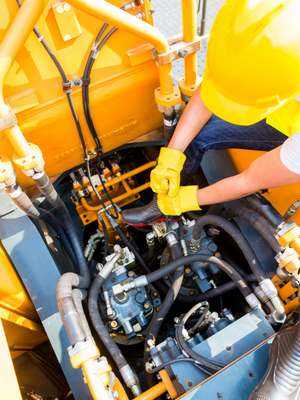 Instead, you stay on top of your fleet and monitor its’ needs before they become emergencies. Tracking allows you to connect directly to your vehicles’ engines to monitor fault codes, odometer readings, and fuel consumption. If there is a fault code, the information is transmitted directly to the manager of the fleet. The data also provides the opportunity to standardize regular maintenance using information like odometer readings, engine hour data, or time since last service. By being proactive in your maintenance approach, you can avoid many expensive repairs. This keeps your budget in line and your vehicles on the road. There are all kinds of useful reports as well. These include distance driven, fuel usage, and idle time. At the end of the day, you will know exactly where your fuel is going. You can monitor driving behavior such as harsh braking and acceleration to identify drivers who may need more training to prevent vehicle damage. You can also set alerts based on fuel usage and speed. Overall, the more safely a vehicle performs and the more efficient it is, the easier it is to save money while protecting your drivers and passengers. If you want to learn more about how to maximize the efficiency of your fleet, download Ridealong with Synovia Solutions. It is filled with the most up-to-date fleet management information to help you increase savings, improve safety and enhance customer service.